Okay, Disney fans, pop quiz: What was Walt Disney’s favorite film he worked on? Some say it’s Bambi, some say it’s Pinocchio, some say it’s Fantasia, and most people, I believe, say it’s Mary Poppins. But there is one film that’s regarded by Disney and film historians as a Disney classic but sadly is not talked about as much as the other Disney films. 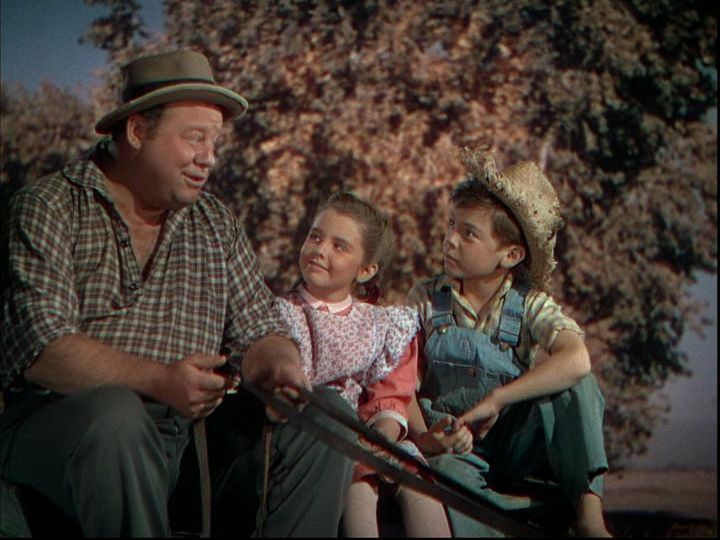 The film I’m talking about is Song of the South‘s less-controversial little brother, So Dear to my Heart, from 1949. That’s right! Disney and I are celebrating the 70th anniversary of this charming film’s release. 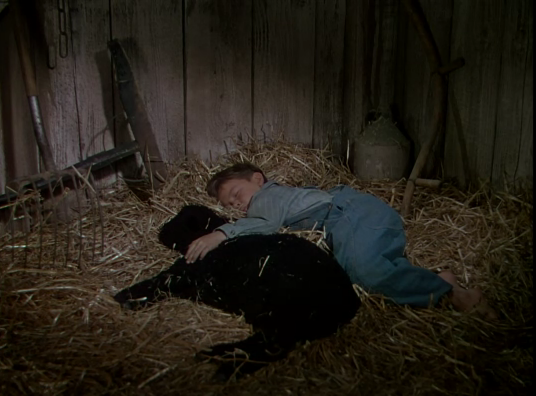 The story of So Dear to my Heart is about a young boy named Jeremiah “Jerry” Kincaid (Bobby Driscoll), living in Indiana in 1903, who adopts a black lamb whom he calls “Danny” after his hero, the famous race-horse Dan Patch. Despite being shunned by his mother for being a “black lamb,” Danny is trained by Jeremiah to enter as a champion in the Pike County Fair. 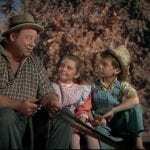 However, despite the support of his Uncle Hiriam (folk-singer Burl Ives in his film debut) and his cousin Tildy (Luana Patten), Jeremiah is always brought back to reality by his stern-but-loving Granny Kincaid (Belulah Bondi). All the boy needs to do is learn some lessons thanks to his scrapbook, which comes alive in the form of hand-drawn animation, in order to achieve his goal. 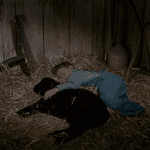 Years later in the mid-1940’s, inspired by the 1943 Sterling North novel Midnight and Jeremiah, Disney decided to make a film adaptation which he called So Dear to my Heart, following the release of Song of the South and several of the package films, such as Fun and Fancy Free and Melody Time. Originally, the film was going to be the first full live-action film Disney would ever release. But there are two reasons/theories why it ultimately changed. The first reason/theory was that RKO, Disney’s distributor at the time, felt that So Dear to my Heart wouldn’t be a Disney film without animated sequences. And the second reason/theory is that the live-action parts of the film were shot in between 1946 and 1947. However, when Disney saw the film in rough cuts, he felt the film wasn’t working and decided to add in animated sequences from Jeremiah’s scrapbook in order to teach and encourage the boy on how to achieve his goal with Danny. The film was premiered in Chicago, Walt Disney’s birth city, on December of 1948 and was released to the general public on January 19, 1949. It has been re-released several times, especially in 1964, 1985, 1992, and 1994 on home video as part of the Walt Disney Masterpiece Collection. Nowadays, it’s been critically acclaimed by film and Disney historians as one of the most charming films Walt Disney has ever produced. But now, it’s not talked about as much as other live-action/animated films like Mary Poppins, Bedknobs and Broomsticks, and Who Framed Roger Rabbit? If there is any petition about this movie being brought back on DVD and Blu-Ray release, sign me up. Not only is the film charming and entertaining, but it also has a nostalgic feeling that touches people who wish to see a film with plenty of emotions, especially for those who grew up in the Midwest like me. Plus, the mixing of live-action and animation is a special treat in this film, especially in the opening title-song sequence with all the animated flashbacks from the scrapbook mixed in with incredible multi-plane camera shots. And do I need to mention it has the Academy-Award nominated song “Lavender Blue (Dilly Dilly)”? In conclusion, if you’re a Disney fan, animation fan, or film fan and you’re looking for an boy/animal friendship that’s also a timepiece picture, I highly recommend So Dear to My Heart. If it’s so dear to my heart—no pun intended—maybe this film will be the same to you. Have you seen So Dear to My Heart? Tell us your thoughts down below!